Preheat the oven to 180 degrees Celsius.Roll out the puff pastry. Roll out the puff pastry. Cut out 8 flower shapes with the cookie cutter and place in the muffin pan being careful to drape the dough, so it does not warp. Leave a small hollow space in the centre, while also leaving some of the muffin cups empty when baking in a muffin pan, so the pastry doesn’t stick together. Carefully mix all other ingredients in a separate bowl. 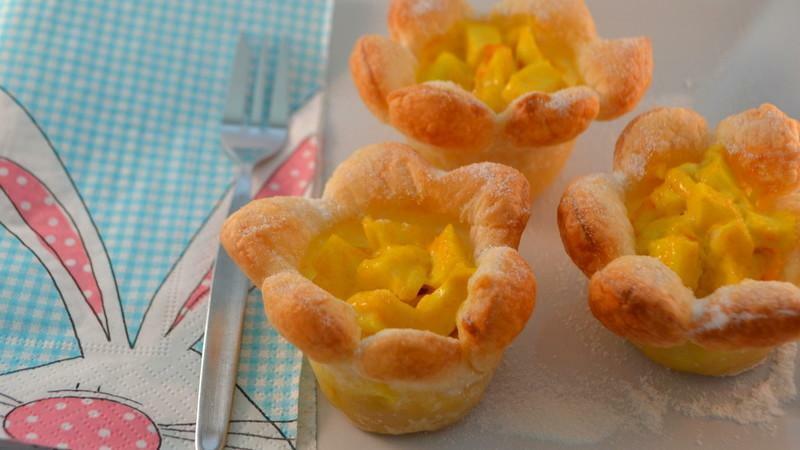 Fill the hollow space of the flower shaped pastry using a spoon. Bake the apple blossoms in the oven for about 15 minutes until the dough turns golden brown. Remove the muffin pan from the oven and allow it to cool down. Remove the flower puffs from the mould and sprinkle with powdered sugar. The contained curcumin in turmeric has potent anti-inflammatory effects and is a powerful antioxidant. It cleanses the liver and the intestines. The magic root also strengthens the nervous system.